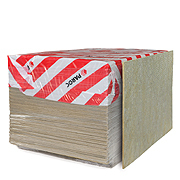 Roof board PAROC ROB 60 is non-combustible stone wool insulation for use as a top layer of existing and new flat roofs. The roof insulation board is developed to provide sustainable, hard and fire safe bedding for most types of flat roof coverings as well as insulating the bearing layer in renovation sites. The compressive stress of the product is 60 kPa, which means that the slab can carry a 6000 kg/m2 load during installation and use. Flat roofs insulated with stone wool means a better insurance against big catastrophes at fire. When using two layers of insulation through going edges are avoided.